So, with a little help from some of my marketing influencer friends, here’s a big list of what NOT to do. Using the wrong name in a pitch email or other inaccurate information (that should really be correct). TLDR requests that take forever or never get to get to the point. Irrelevant requests that have little if anything to do with the influencer’s expertise. Not making it clear what the value exchange is. Being too familiar and friendly with influencers on the first contact. Hey, we’re not actually friends (yet) are we? Making it difficult by asking numerous, complicated questions, like those fun essays in college. No credibility. Emailing a pitch from a gmail address and pointing to a website that looks really spammy or just bad. #influencerstalking Following up one day after the first pitch. Then again the next day. Then again the next day and so on. #failuretofollowup Asking for participation and then never following up. Cold shoulder. Engaging an influencer online several times and then ignoring them when in person at industry events. Lying or being disingenuous in any way. Bait and switch. Offering access to a tool to preview, then requiring an guided demo where the influencer is “sold to”. Bait and switch 2. Inviting the influencer to an event, then requiring attendance of a presentation where the influencer is “sold to”. Micromanage. Requiring an unpaid influencer to cover specific topics in specific ways to the brand’s benefit that are not natural to the influencer (or their community). Taking advantage. Expecting an influencer to do for free, what really should be paid for – moderating a panel, writing substantial content, extensive participation requirements. When a brand takes unearned credit for ideas the influencer created, wrote about and used in their business. Misappropriating. Using influencer content in ways never intended, especially when it is monetized by the brand or someone else entirely. Also, misrepresenting how the influencer’s contribution will be used. For example, saying it is for a public article and then using it for a gated ebook. Making public, disparaging remarks or being disrespectful about an influencer. Not being patient – these people are busy! Switching the conditions of participation – shame on everyone if there is not a written, signed agreement for specific expectations. Not being thankful for the influencer’s efforts. This goes both ways too – influencers should be thankful for the opportunity as well. Failure to communicate. Managing communications and coordination poorly, in a disorganized way and without clear direction. No edits. Publishing influencer content “as-is” without copyediting. Being an asshat. Going over the line with sarcastic humor in influencer communications – you really need to know if they’re in to that. Slimy SEO. Taking the influencer’s contribution and then SEO-ing the heck out of it with keywords and anchor text galore. Backchannelling. Reaching out the the influencer’s “boss” or co-worker to ask why the influencer hasn’t responded to pitch emails. Not being clear about the premise or context of the ask and thereby confusing the pitch. Being one sided. When brands do not follow through on commitments made to the relationship. And you are? Changing the client side contact and not doing any kind of hand off to ensure continuity. Making it incredibly difficult to share the result of the brand/influencer collaboration. i.e. not providing pre-written tweets and social shares, properly sized graphics, embed codes, etc. Basically your takeaway from this list is, don’t do these things! Learn from these mistakes, pet peeves and advice. To be successful with an influencer relationship, brands need to consistently make an effort to research the experts they want to engage and find out what motivates them. Create value and set clear expectations. Make working with your brand a very easy and satisfying experience. Listen and communicate in a meaningful way – not too different than any relationship, actually. You can also learn more about the influencer marketing services at TopRank Marketing. If you’ve been on the receiving end of influencer outreach and communications, what are some of your pet peeves? As outstanding as this list is Lee, I think you missed a big one (or am I the only person this happens to?) – completely off-topic pitches! (Which show the PR flack really has no idea who you are.) I blog about b2b technology marketing and related topics – yet I’ve received pitches about fast food restaurant videos, new menswear brands, Hollywood movies tie-ins to food brands, and pet care products (just in the last few days). Ugh. No worries Mark, it is how we learn. Following up is a great idea as long as it is respectful, personal, succinct, actionable and relevant. 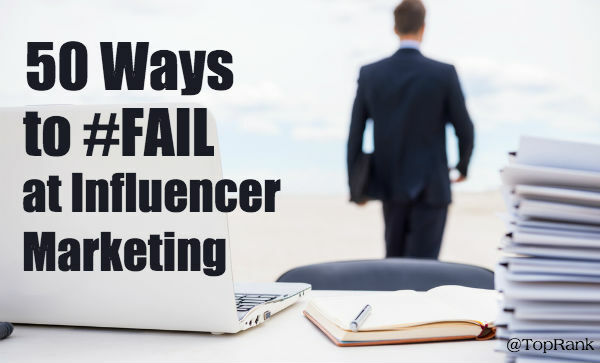 Wonderful list of fails on influencer marketing. A few of them even make one never be in connect with a targeted influencer. They are the people who don’t have time to review their decision and once they de-friend someone never add him again. Thanks a lot for sharing this epic post. Make it relevant and valuable to the influencer before you ever get to the ask. Figure out what’s in it for them first. Try to engage lightly before reaching out by following, commenting and sharing first. Short messages are good. Meaningful is best. Enjoyed this post, but wished I had found it even a day earlier as entering into my own influencer marketing campaign and just identified about 5 different things I should have avoided. Have this post now favorited, so won’t be making those same mistakes again. Thanks Lee! All these points – so helpful. So important to remember that influencer marketing isn’t a science, but an art.